I noticed a lot of new things happening here in the Hollow now that Spring is heading this way. Oh, sure the Daffodils and the Tulips and other early bloomers are peeping up out of the ground. And each day, after I walk, I take a little tour around the yard to see what's new and sometimes what's old too. Old is good. I like old just as much as new! However, what this bit of news is about today, is something that should make us all smile. One of my favorite birds is back in town so to speak! Listen carefully when you are outdoors. Listen to a bird that seems to be saying...DRINK YOUR TEA. Honest to goodness, that's just what it sounds like! You will generally find these birds at lower levels. They are typically only a few feet off the ground and, as you can see, they are as handsome as ever. Actually in person, they are even more striking! JP, I have never seen one of those here...maybe we are out of their area. I will have to check. We enjoy feeding and bird watching. I just discovered you have whole other areas on your blog for me to check out. I will be visiting the garden section next. Baking and gardening....my two favorite things. Yes, I'll have to check to see if these birds visit our area - I've never seen one. Looks like a beauty! I never heard that about the drink your tea. Cute! Never heard of them. What a pretty little bird. I wonder if they are in Iowa? I've never seen one but we have lots of others in our yard and I love to watch them. Right now they are starting to sing again, love that!...they aren't going to be happy with all this new snow we are getting! 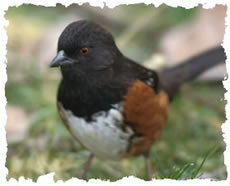 I saw a Towhee for the first time last year--It became a favorite along with the Eastern Phoebe. I've not see either yet this year, but today I saw my first Robin, needless to say I was a bit excited! Stay warm--I'm hoping we're on the other side of winter! What a pretty bird. I have never heard of him before. I have recently purchased a Birding book since there are so many birds here in the deep South - I am going to start marking them off as I see them on my daily walks around the lake with Gizzy - and bring my binoculars! That's a wonderful activity to watch the birds of the air and water!